I want to know for sure if you can use polystyrene trays (such as those that meat comes in) in the microwave oven? I have read some fairly official looking reports and articles that say there's not danger, but there is some anecdotal evidence that they can melt, which while apparently harmless, is not ideal. Yes, when done under correct instruction. The answer to this question is more complicated than just putting a piece of chicken on a block of packing foams. Polystyrene does not contain water molecules, so it does not heat up when microwaved. Any heating of polystyrene in a microwave is due to indirect heating from the food itself (Source). Polystyrene is a plastic which have melting point of 240°C, however the melting point of polystyrene is largely irrelevant because polystyrene starts to soften around 80-100°C (Source). Since most food is composed primarily of water which evaporates at 100°C, and since a microwave oven heats the food directly rather than through ambient temperature, food heated in microwave rarely go above 100°C under normal operating condition. For comparison purpose, the melting point of common plastic categories used in household products: Polyethylene terephthalate/PET 260°C (Source), Polyethylene/PE 115-135°C (Source), Polypropylene/PP 130–171°C (Source), Tupperwa/r/e is made of high-density polyethylene (HDPE) is not rated for microwave, but Tupperwa/v/e that is rated for microwave and is made of polypropylene can be used up to 180°C (Source). Note that there are a wide variability in the melting point of each plastic categories because many plastics are manufactured with additives to alter their properties to suit their intended usage; when not designed for contact with food, some of these additives may be toxic, so only use food-grade plastics for dealing with food. As with any usage plastics there are concerns regarding migration of chemicals in the polystyrene to food. The primary one that is often quoted is styrene. One concern is that heated polystyrene may break down to styrene in very high temperature, but this is generally considered a non-issue at the temperature of a microwave. At normal usage temperature, polystyrene do contain a trace amount of styrene due to imperfection in manufacturing processes. However, the level of styrene in polystyrene is comparable to the level of naturally-occurring styrene in many common food items (Source). Polystyrene is a polymer of styrene, but they have totally different properties. 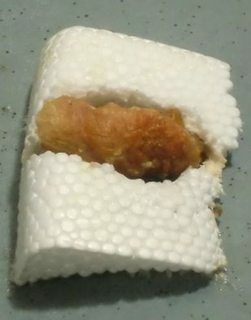 Polystyrene itself is generally considered to be safe as it is very inert; however, while styrene is not yet classified as carcinogen, it is suspected to be one (Source). "Epidemiology studies to date do not provide clear evidence that styrene causes cancer" (Source). At very high level styrene is a neurotoxin (Source), but this is non-issue at the levels found in food containers. However, polystyrene may not necessarily be the best container to heat up your food for other reasons. While the melting point of polystyrene is only slightly lower than other common plastics, polystyrene starts to soften at around 80-100°C, and handling a floppy cup filled with near-boiling water can be very dangerous. Also since foamed polystyrene is a very poor conductor of heat, you cannot rely on the temperature of the exterior of the cup to sense the temperature of its content. Microwave-safe polystyrene can be safely used to reheat food in microwave when used according to instructions. Never use polystyrene in conventional oven, and do not use polystyrene to cooking, only reheating. Defrosting meat from polystyrene is most likely of negligible risk, cooking the meat till it's well done is not. Always read the label before using any plastic in microwave. Only use polystyrene plastic that are labelled as microwave safe and never exceed the prescribed operating temperature. Do not reuse single-use containers. If a single-use polystyrene container is rated for microwave use, only use the container for reheating once only. Transfer food to glass or ceramic when you are heating food to the point where a soft polystyrene container can pose burning hazard. Note, as this is cooking.SE rather than greenpeace.SE, I am excluding discussions that are not directly related to microwave and food, such as environmental/recycling concerns. If you are considering commercial usage of polystyrene materials, you should evaluate these aspect of the issue yourself. There are many cities that ban the use of polystyrene due to primarily environmental concerns rather than safety issues. Well, I can tell you with absolute authority that polystyrene melts in the microwave. 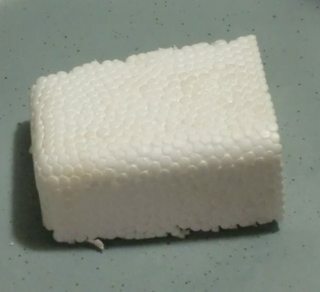 Here's a chunk of polystyrene cut from a foam shipping container. I double checked with the website (Propak), and the stuff is polystyrene. I placed a random chunk of chicken on the cube, and microwaved on high for 1 minute. So yeah, it melts. Is it toxic if it melts into your food a few times? Probably not. Should you do it? Probably not. Polystyrene is a thermoplastic polymer with a glassy state at 100°C and a melting point of 240°C. It is this that makes it recyclable as it can be heated and remoulded into new items. Before the melting the polystyrene will start to break down as bonds start to break and all kinds of nasty gasses are released. The fact it melts at all at such a low temperature is enough to say that it is a bad idea to put it in the microwave. The fact it goes glassy and then melts at such low temperatures also means it is not oven, kettle, hob, dishwasher, <any other heat source here> safe. Here is something that may help with the issue of polystyrene melting in the microwave. 2) A polystyrene cup filled with water will also never melt because the water can only be raised to 212 degrees F, and then it boils and evaporates. The polystyrene does not yet melt at this temperature. I have damaged a couple of microwave-safe plastic containers because a small piece of cheddar cheese, or some similar oil-bearing food, was in contact with the plastic during microwaving. 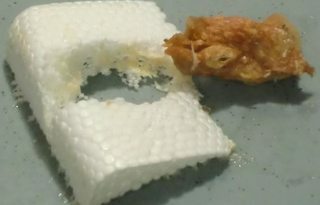 So re-heating a piece of oily, fried chicken in a microwave-safe plastic container could cause small parts of that container to scorch or melt. Thus, even microwave-safe containers are subject to localized scorching or melting. Use microwave-safe ceramic/glass to avoid this possibility. Note also that drops of oil or fatty food left in contact with some plastic surface inside the microwave oven will, over time cause damage to that surface for the same reason. Not the answer you're looking for? Browse other questions tagged food-safety microwave or ask your own question.